Should You Buy Sasol Limited (SSL)? The elite funds run by legendary investors such as David Tepper and Dan Loeb make hundreds of millions of dollars for themselves and their investors by spending enormous resources doing research on small cap stocks that big investment banks don’t follow. Because of their pay structures, they have strong incentives to do the research necessary to beat the market. That’s why we pay close attention to what they think in small cap stocks. In this article, we take a closer look at Sasol Limited (NYSE:SSL) from the perspective of those elite funds. Hedge fund interest in Sasol Limited (NYSE:SSL) shares was flat at the end of last quarter. This is usually a negative indicator. At the end of this article we will also compare SSL to other stocks including Hewlett Packard Enterprise Company (NYSE:HPE), Newmont Mining Corp (NYSE:NEM), and Advanced Micro Devices, Inc. (NASDAQ:AMD) to get a better sense of its popularity. To the average investor there are a lot of formulas stock market investors can use to analyze stocks. A couple of the less known formulas are hedge fund and insider trading interest. Our experts have shown that, historically, those who follow the top picks of the elite hedge fund managers can trounce the broader indices by a significant amount (see the details here). Let’s review the fresh hedge fund action regarding Sasol Limited (NYSE:SSL). How are hedge funds trading Sasol Limited (NYSE:SSL)? Heading into the first quarter of 2019, a total of 7 of the hedge funds tracked by Insider Monkey were long this stock, a change of 0% from the second quarter of 2018. By comparison, 4 hedge funds held shares or bullish call options in SSL a year ago. With the smart money’s sentiment swirling, there exists an “upper tier” of key hedge fund managers who were adding to their stakes significantly (or already accumulated large positions). Among these funds, Renaissance Technologies held the most valuable stake in Sasol Limited (NYSE:SSL), which was worth $12.2 million at the end of the third quarter. On the second spot was Arrowstreet Capital which amassed $11.2 million worth of shares. Moreover, Pzena Investment Management, AQR Capital Management, and Citadel Investment Group were also bullish on Sasol Limited (NYSE:SSL), allocating a large percentage of their portfolios to this stock. Seeing as Sasol Limited (NYSE:SSL) has experienced a decline in interest from the smart money, it’s easy to see that there lies a certain “tier” of funds that decided to sell off their entire stakes in the third quarter. 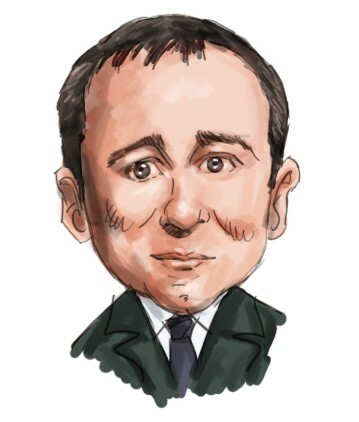 It’s worth mentioning that Israel Englander’s Millennium Management sold off the largest stake of the 700 funds tracked by Insider Monkey, comprising about $0.6 million in call options. Matthew Hulsizer’s fund, PEAK6 Capital Management, also sold off its call options, about $0.4 million worth. These transactions are important to note, as total hedge fund interest stayed the same (this is a bearish signal in our experience). Let’s now review hedge fund activity in other stocks similar to Sasol Limited (NYSE:SSL). These stocks are Hewlett Packard Enterprise Company (NYSE:HPE), Newmont Mining Corp (NYSE:NEM), Advanced Micro Devices, Inc. (NASDAQ:AMD), and SBA Communications Corporation (NASDAQ:SBAC). This group of stocks’ market valuations resemble SSL’s market valuation. As you can see these stocks had an average of 30 hedge funds with bullish positions and the average amount invested in these stocks was $767 million. That figure was $27 million in SSL’s case. SBA Communications Corporation (NASDAQ:SBAC) is the most popular stock in this table. On the other hand Advanced Micro Devices, Inc. (NASDAQ:AMD) is the least popular one with only 28 bullish hedge fund positions. Compared to these stocks Sasol Limited (NYSE:SSL) is even less popular than AMD. Our calculations showed that top 15 most popular stocks among hedge funds returned 19.7% through March 15th and outperformed the S&P 500 ETF (SPY) by 6.6 percentage points. Unfortunately SSL wasn’t in this group. 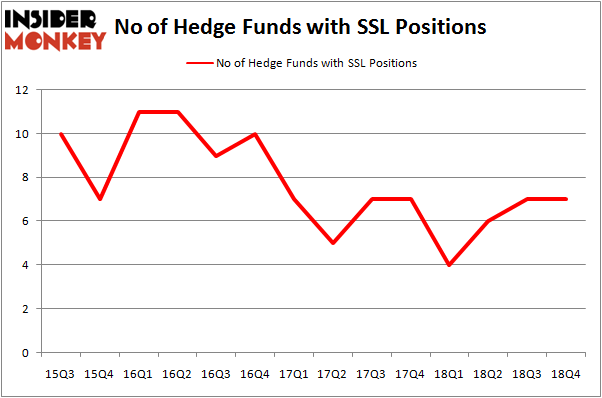 Hedge funds that bet on SSL were disappointed as the stock returned 3% and underperformed the market. If you are interested in investing in large cap stocks, you should check out the top 15 hedge fund stocks as 13 of these outperformed the market.